You might remember one of my recent blog posts where I reported that the golf course at Tacoma C&GC was built on what was once a prairie. If you didn't read that post, you can do it right now by clicking HERE. Many of you approached me after I posted that history lesson and praised the effort I was making to protect this important legacy. In the same way I know that many are not interested in protecting this threatened ecosystem. As with most things we do as a Committee, there will always be those on both sides of the debate. Personally, I'm very excited about the work we're doing at this very moment to preserve what's left of the prairie and if you happen to be a Garry Oak Tree, you will be happy that the Club is taking steps to preserve you and propagate you. Before I get into specifics of what that means, let's just take a moment to define "prairie". I think most people think of prairie as the large grasslands in central North America known as the great plains. That is only one type of prairie. The picture above was taken on arguably the most famous prairie golf course in the country. That is Prairie Dunes Country Club in Kansas and it's currently ranked 25th on the list of 100 greatest golf courses in America. As you can see, the prairie that Prairie Dunes was built on is very similar to that type of prairie that Tacoma was built on. These are not grassland prairies. They are sparsely wooded prairies which are specifically referred to as oak savannas. As you may know, the oak savannas that once covered our region are all but lost and as a result, the Garry Oak which is Washington's only native oak tree, is becoming one of the most threatened tree species. Why are the oak savannas disappearing? Much of the land has been taken for farming or development but mostly the savannas are shrinking due to the lack of fire or periodic burning. Without fires to keep them in check, fast growing conifers eventually overtop and ultimately kill the sun-loving oak trees. In the mid 1800's, European settlers arrived and put a stop to the regular burning of the woodlands. Click HERE to read more about oak savannas which are now considered one of the rarest plant communities on earth. So what are we doing to protect and preserve the oak savanna here at Tacoma C&GC? First of all we are trying to address the oaks that are most at risk. Specimens like this one on 16 approach which have suffered serious damage are being closely monitored. 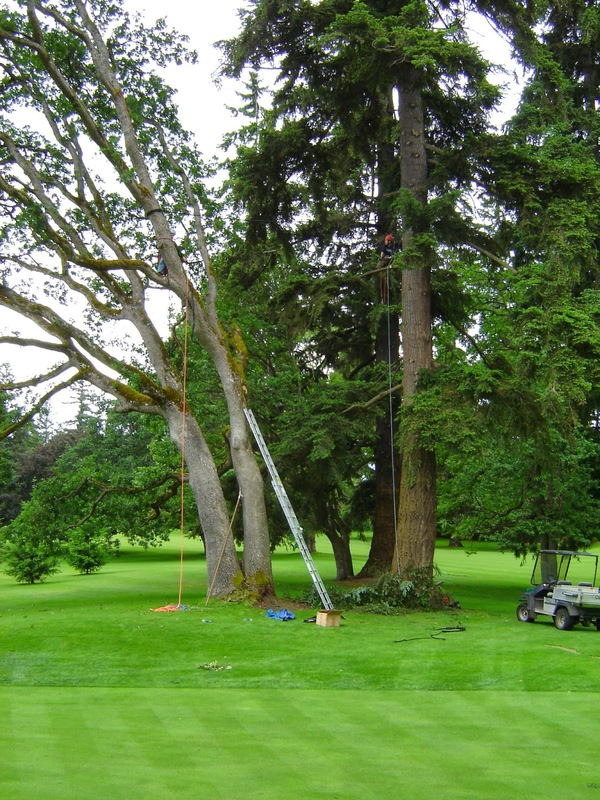 Here you can see that particular tree being cabled to the adjacent fir so as to prevent total failure. Right now we have over a dozen Garry oaks on the course which have cables in them in order to strengthen their branch structure. To date we have lost only one oak tree that has been cabled. It is definitely a strategy that works. It is also a strategy that is expensive so we cannot put cables in every oak tree. So what steps do we take to protect the oak woodlands? Right now we are taking a pro active roll in simply making sure each and every oak tree gets a fair chance to live out it's entire life. In order to do this, we need to give these trees the growing conditions that they are adapted to. Oak trees need full sun exposure and good air flow which is what they would get if they still lived on a native oak savanna. So are we restoring the savanna? Only in our dreams. Restoring the savanna can only be done by reintroducing fire and periodically burning the woodlands. This isn't going to happen since we are also interested in protecting the playing field for golf. Thus, we need to manually work at sustaining the nature of the savanna as a sparsely wooded green space in order to favor the growing conditions that encourage the survival of the oak trees. Simply stated, we need ensure that only native species occupy the golf course green space and control their numbers to mimic the typical density which would be found on a true oak savanna. As good environmental stewards, the Club is already actively doing some of this work. Check this out. The image above is a 1979 aerial of the south end of the property. Notice I added the hole numbers on the image, but of course in 1979 the holes we know today as 13-15 haven't been built yet. Look at the parcel of land where those holes eventually were built. It looks pretty much the same as the rest of the course. At that time, it was a nice oak savanna with the same density of trees as the existing golf course. Now look at an aerial of that part of the golf course today. 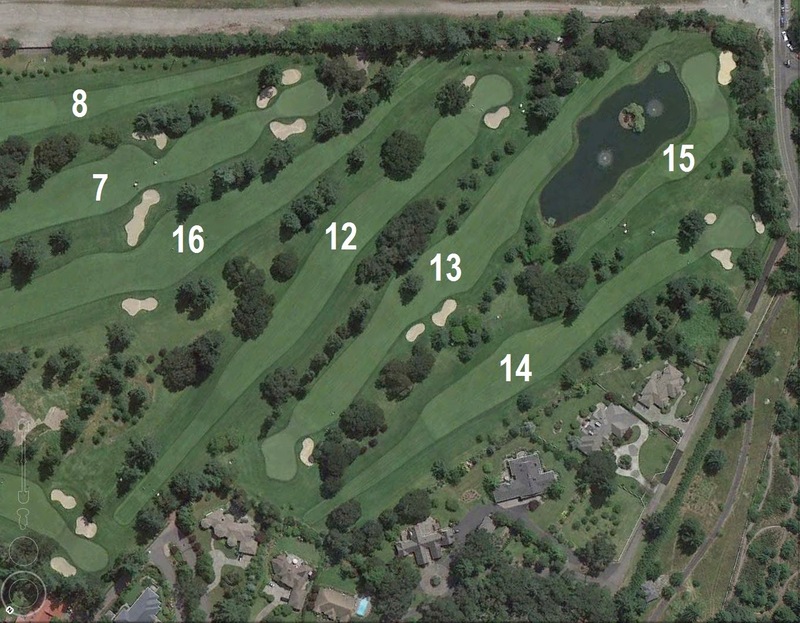 Specifically, look at the 13th hole. 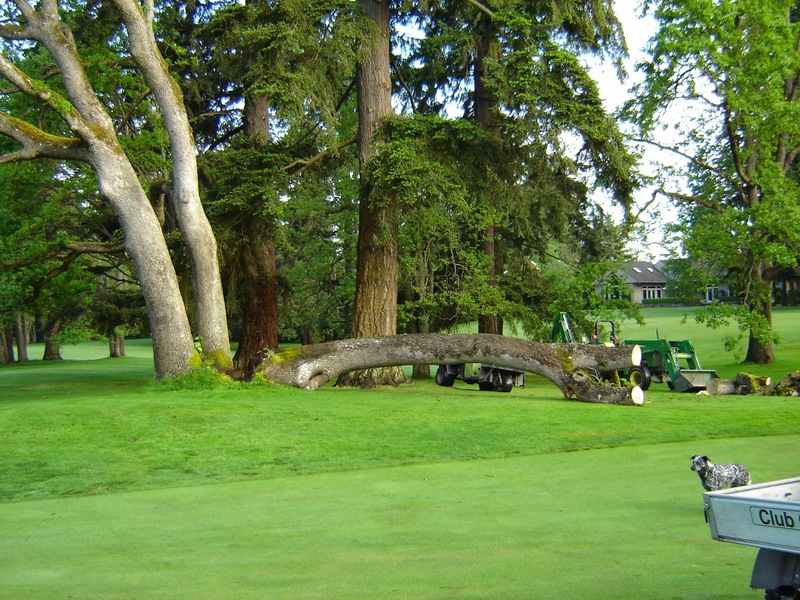 Notice that there is a continuous tree canopy from tee to green bordering both sides of the hole. Over planting of the hole began about 14 years ago and yes, I myself planted many of these trees. Since then I have come to realize just how serious the subject of tree planting is. I now know that planting trees on a golf course should be done very carefully. 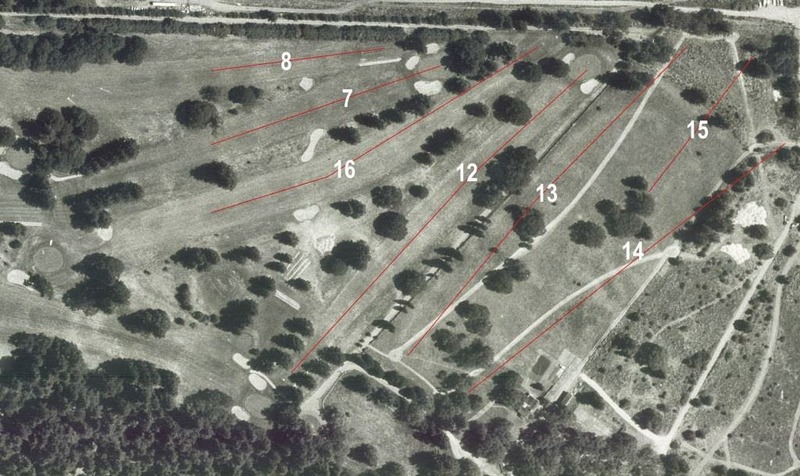 In this particular case, if all these trees were allowed to grow to full maturity, the 13th hole would soon be one of the shadiest holes on the course and likely have some of the worst turf conditions. Not only that, the oak trees would certainly decline and eventually be lost to overtopping by the fast growing Douglas firs. I've always known about the oaks being threatened, but just recently I've come to understand the importance of the oak savanna ecosystem with which they came to be. I am thrilled that today we are admitting our mistakes in regard to overplanting some areas on the course and taking steps to correct them. In fact, the following project was approved back in February but it wasn't until this recent cold snap that we had the time and conditions to carry it out. 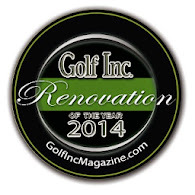 The frozen ground allowed us the opportunity to get equipment out to some areas on the 13th hole with minimal damage. Before things thawed out we were able to remove many of the juvenile trees in that area. Here's a couple of before and after pics. Above you see the area between 12 and 13 near the 12th green before thinning the trees. The picture below is how it looks now that the trees were thinned out and the open space has been restored. Above is a picture from 13 tee before thinning the trees. Below is a picture from 13 tee after thinning the trees. Notice we left all of the more mature trees which are properly spaced out allowing good sunlight and air flow. The oak trees surrounding the 15th tee now have a good chance at surviving for many more generations. I also expect we will immediately see turf conditions improve in these areas. That's one of the best parts of this effort. Turf requires good sunlight and air flow just like the threatened oak trees. When we implement practices to favor the oaks, we also favor the turf. 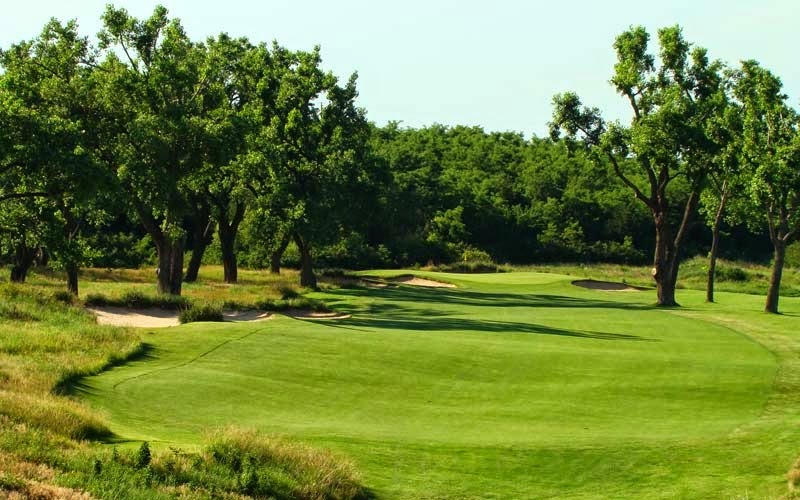 Protecting the savanna is truly a "win win" for the golf course and it's future legacy.